When an on-demand print and binding shop in Nebraska wanted to upgrade its in-house capabilities, Mike White of Document Finishing Resources stepped in to help. This Formax Dealer suggested two solutions: the Atlas C300 Automatic Creaser/Folder, and the Cut-True 29H Hydraulic Guillotine Cutter. We recently spoke with Alicia, the shop's Bindery Manager, who described how these additions have helped streamline their operations and take on more business. Creased and folded jobs are a mainstay in the on-demand print business. Digital prints benefit from creasing prior to folding, which provides a professional-quality finished piece without cracking. While the shop originally sought to replace an aging creaser with a more efficient model, creased jobs were still being folded by hand. For a job of 2,000 pieces, this required 4 people up to 2 hours to complete. 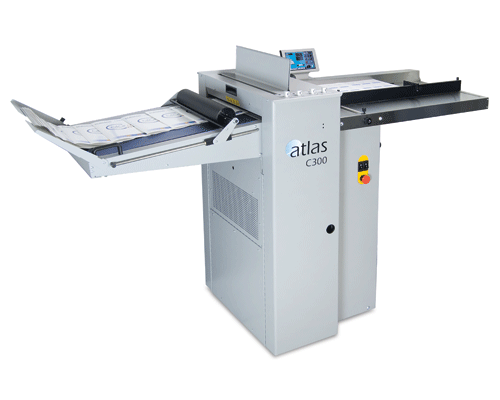 With the Atlas C300, their jobs are now creased and folded in a single pass, up to 6,000 sheets per hour. This cuts processing time to under 30 minutes, and requires a single operator instead of a handful. Alicia said using the C300 has allowed staff to take on more jobs, and after a few months, they've already seen a return on their investment. 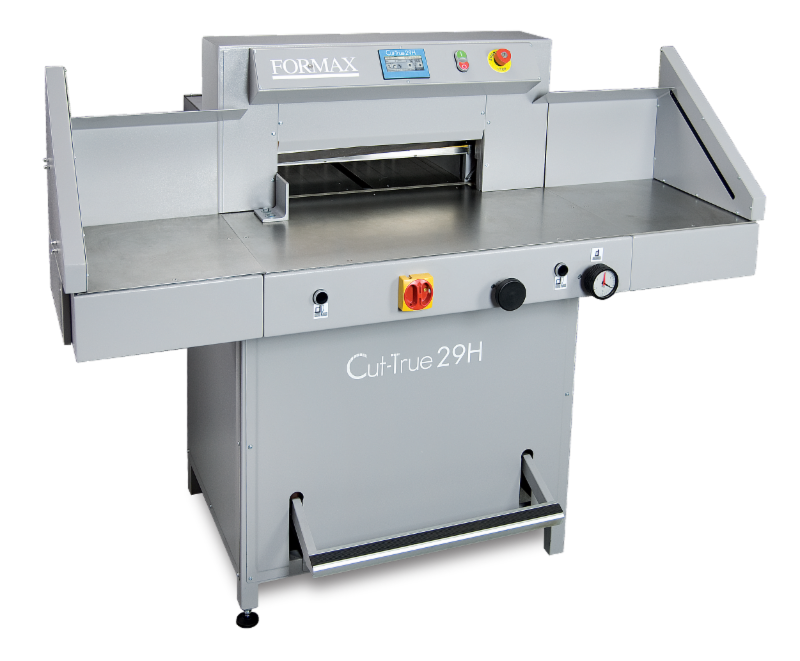 To replace their old large-format cutter, White recommended the Formax Cut-True 29H Guillotine Cutter to handle their most common cutting jobs, including business cards, buck slips, and multi-cut projects. It includes a variety of user-friendly features like an anti-friction surface and LED safety curtain. With a rugged, heavy-duty design, the Cut-True 29H is ideal for their two production shifts. The touchscreen with pre-set and programmable jobs makes it easy to train new operators. Hydraulic clamp pressure is easy to adjust, providing the best clamp possible for different paper weights and stack heights, while the LED cutting line and foot pedal pre-clamp allow operators to check the paper position and adjust if necessary. 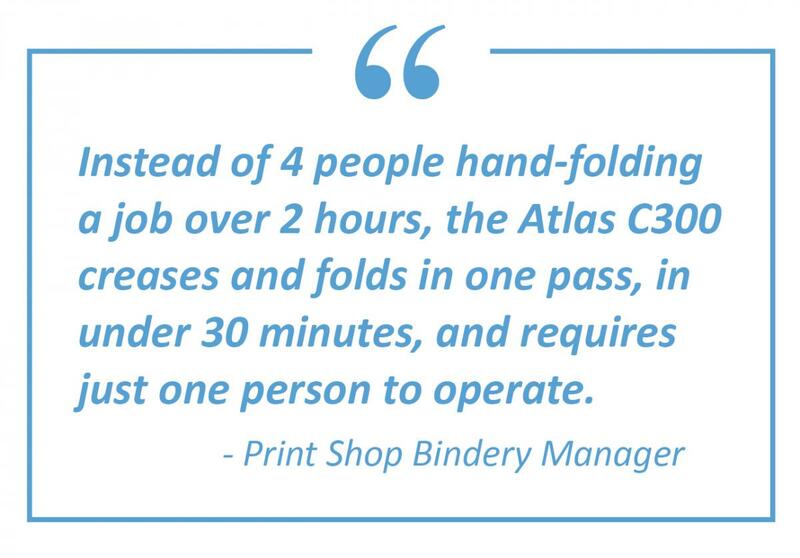 With the addition of these robust Formax print finishing solutions, Alicia said they would definitely recommend the Atlas C300 and Cut-True 29H based on increased productivity and dependability.